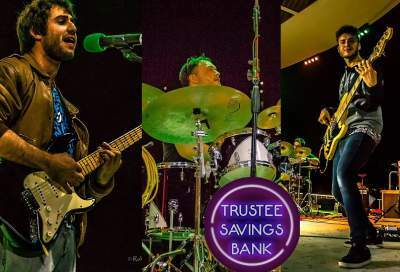 Trustee Savings Bank are a 3 piece alternative indie rock band from South Florida.The members include Jesse Balber Lead vocals & lead guitar,Michael Martin N’Dong backing vocals & bass guitar & Thiago Medaljon on drums. They write & perform their own original brand of music at live gigs in the Miami/ Fort Lauderdale area. Venues include Churchill’s, PRL & Wynwood Warehouse Project & others. The band was formed 2 years ago by Jesse,Michael with then drummer Jorge Pardo.Since Jorge’s departure over a year ago the band have had several drummers perform with them but were happy to announce in June 2016 Thiago as their latest permanent addition.The band’s songs are tinged with many influences from many genres of music from Rock,heavy metal,indie & punk to funk,,jazz & blues. Both Jesse & Michael have been musicians through their school years and in addition Michael is a music major @ Broward college.The band have released a series of singles with the intention of producing their first EP. But as their body of work has grown with a loyal and rapidly growing fan base, they’re looking forward to releasing their work as an album in early 2017 instead.